Enjoy Cabot's Classic Sharp cheddar, the standard by which all other cheddars are measured! The Classic Sharp Gift represents the simplistic and timeless quality of Vermont. 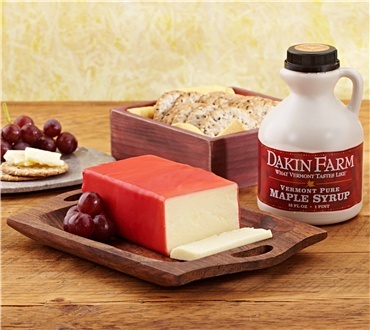 This farm-scene box includes a one pound block of hand-waxed Cabot Classic Sharp cheddar, and 16 ounces of pure Vermont Maple Syrup. Sit back, relax and enjoy! This cheddar is one of my favorites in quiche...the flavor stands up to cooking,and also excellent with apples & walnuts salad. GREAT cheese.